8DIO released this weekend three new roots instrument sample libraries, a fiddle, a trumpet and a washboard. For Black Friday, Embertone offers a 25% discount off all its wind sample libraries for Kontakt. With the three Phalanx sound libraries, Spitfire completes the brass sections of its British Modular Library Series. The Spitfire British Modular Library now includes a collection of trumpets, which first volume has just been released. Have you ever mimicked a trumpet solo while listening to the Benny Hill Theme ? Well, you can now use these weird sounds in a library. HV Synth Design has released Total Trumpet, a new VST instrument plug-in for Windows featuring natural sounding trumpet sounds, including overblowing. Samplemodeling has announced the release of version 2.0.1 of The Trumpet. This major update is provided free of charge to all customers. HV Synth Design has released a second important update for the Trumpet Collection. 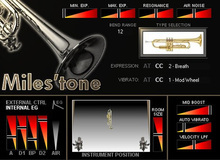 HV Synth Design has released an update for the Trumpet Collection adding a second jazz trumpet (JazzXtreme) to the collection along with some fixes. Sample Modeling Introduces "The Trumpet" Sound Library.